I was in Soho yesterday afternoon and passed by the shop that sold out of 800 of these bags in three hours. Hopefully this will result in 800 fewer black plastic bags hanging from trees and ending up in the landfill. i saw something about this on tv the other day and i thought, this is so stupid. i simply carry shopping/plastic bags in my backpack with me all the time and i re-use them when i shop. the people lining up to buy this are doing it so they can re-sell these on ebay for a big profit. Wow, this brings up other ideas for promoting things as NOT something! Or a t-shirt for a pregnant woman that says ” I am NOT pregnant.” That would make me laugh. tsuhyang, it appears that you are correct, these bags are now going for $179 on ebay! in other words, if some of the viral marketing craze that makes people want this bag so badly translates into positive actions (regardless of their motivation)… we’ll take it! 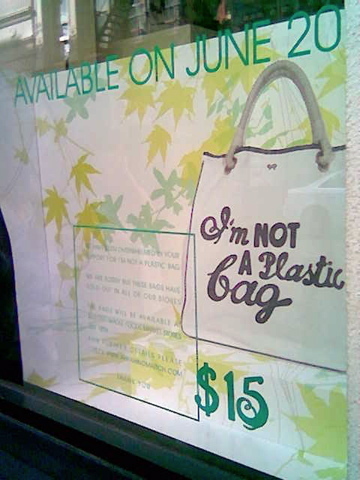 I’m desperately looking for this Anya Hindmarch “I’m Not A Plastic Bag” bag i’m in love with. I live in Barbados, Caribbean and it is not available here. Can anyone please tell me where I can buy it? Please don’t tell me eBay. My arm is lonely without this bag. and while we have you here… can you tell us what you plan to use it for? It doesnâ€™t really matter where itâ€™s made, or what itâ€™s made out ofâ€¦ The point is, people who like this bag will want to use it and that in itself can reduce the consumption of plastic bags. The goal wasnâ€™t to diminish child labor or cheap labor in China. If people like this bag and decide to use it as an alternative to plastic shopping bags, then the message and goal is effective. People who want this bag know its intended purpose and ultimately itâ€™s a personal choice to stop using plastic or not. The bag itself doesnâ€™t make a difference, itâ€™s the attitude people adopt. The message is boldly imprinted on the bag so itâ€™s promoting awareness and a 2nd look at things. Like if you bring it to a supermarket where everyone is packing their stuff in plastic, they might think twice next time. —-BTW, don’t be fooled by the price drop of these bags on ebay, there are tons of fakes out there, over half of them are sold from China now. Beware of the lack of pictures, new sellers with little or no feedback!!! I think that recycled durable bags are great educational tools in conjunction with plastic bag recycling programs.